This blogpost has a soundtrack. Hit play. Just when it seemed modern societies had put us all in a deep trance, that we were on the verge of a docile new world, a new insurrectionary meme emerged. A virus is spreading in the operating system of global capitalism, crashing systems worldwide. The strongest vectors of the virus are the cradles of civilization, Egypt and Greece. As the virus mutates, it becomes stronger and more creative. In the last month the virus hit Turkey and Brazil. 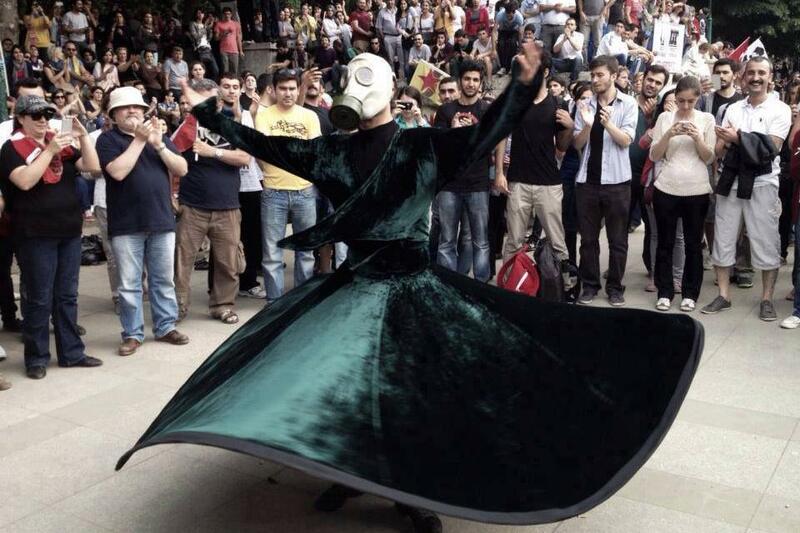 I write from Istanbul during a lull after the spiciest days. The first thing I noticed here are the feral animals. Friendly gangs of both dogs and cats own the public space. Keep in mind that dogs are exiled in Africa, Arabia and much of Asia. Cats own the streets of the east. Turkey is the unique geography of intersection, a place where canine Christendom blends with feline Islam. 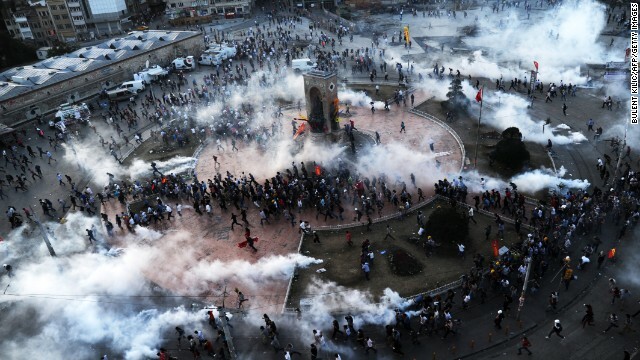 The mix of tactics in the Turkish uprising are equally mashed-up from parts east and west. Here we find the risk-taking commitment seen from Tunisia to Tahrir mix with the clever postmodern humor & non-violent strategies common to the plazas of 15M (Spain) or Occupy Wall Street. Here they have it all. Anyone watching the news will have seen the pitched street battles, the barricades made from flaming police cars, a city clouded in tear gas, a stolen bulldozer leading a mob to storm the square. But there are also phenomena like the penguins, standing guy, Talcidman, gasmask dervish and of course the wiggling applause fingers. It always starts with some humble spark, in Istanbul it was an urban development scheme that involved razing some trees in downtown Gezi Park. The tools of distraction (youtube, twitter, facebook) are quickly repurposed into tools of action. Once again we see the help from the "creative class", people who might make corporate adverts by day, out in the street by night, Canon 5D in hand, making sophisticated documents on the revolt. Where did all this discontent come from and why is it so generalized? From New York to Sao Paulo to Athens to Istanbul why do all kinds of normal people get drenched in chemical weapons and risk death? I think it comes from an natural human instinct to "shape" our reality instead of consuming it. Ironically it is when we join the swarm that we reclaim a sense of personal relevance. One thing is certain, the insurrectionary virus brings out the best in people. Any participant will have experienced acts of heroism and sacrifice, the kind of behavior we thought was only the stuff of fiction. In an important break with the movements of the 20th century, this new form of protest does not promote a canned ideology or a charismatic leader. It operates beyond the old binaries of left and right, religious and secular. Istanbul'suprising brings together environmentalists, the LGTB community, Kurds, Nationalists and even a group called "anti-capitalist muslims." The insurrection virus somehow connects and emboldens masses of people who considered themselves apolitical. The Turkish have a laundry list of points to protest: the tree removal, the new alcohol restrictions, censorship, the ecologically dubious new bridge over the Bosphorus. But none of these issues, even all of them summed together, constitute enough motivation for the passion and rage of the last month. It's the bug. This virus is a response, a counterattack, to a fundamental sickness in our global civilization. We need a new, more horizontal, form of democracy, we need to seize power back from the the 1%, and we must find a sustainable way to live on this earth. Until then expect insurrection.